It seems that new archaeological discoveries from Jerusalem are being reported almost weekly. The latest find is rather fascinating. It was humorously identified by the Israeli Antiquities Authority as the original "store credit." And that's probably a good way to describe it! 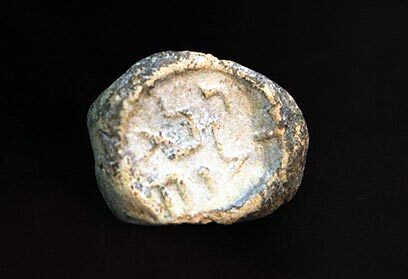 What they discovered was a clay seal containing two Hebrew words from the time of Herod's temple. The seal appears to have been a type of marker or "proof of purchase" used as part of the temple services. The inscription on the seal, written in Aramaic, reads "pure to the Lord," using the first two letters of the name Yahweh as the abbreviation for "Lord." "Whoever required libations would go to Yohanan who was in charge of the stamps and give him money and would receive a stamp from him in return. He would then go to Ahiyah who was in charge over the libations, give him the stamp, and receive the libations from him." In other words, a person would pay for a specific ritual sacrifice at the "cashier's office" and receive a "proof of purchase" token that he or she would then take to the priest to exchange for the actual offering. This seal appears to be the first actual example of the "stamp," or clay impression, that served as the "proof of purchase" token. The find is significant for two reasons. First, it helps illustrate and visualize the day-to-day workings of the temple. And second, it serves as one more small reminder that a Jewish temple indeed stood on the Temple Mount in Jerusalem. That seems obvious to those of us who believe the Bible. But in the convoluted world of Middle East politics, it helps counteract the propaganda claiming the Jews have no legitimate connection to the city or the Temple Mount.